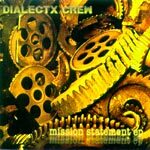 Dialetcx crew return with a brand new teaser EP on CDR. Nominated by the 2002 and 2004 San Diego Music Awards for Best Hip Hop Album! Produced by Jwon Unreal except: 1 & 4 by Mista Aware. All scratches by DJ Norm Rocwell!